There's a big pot of Sweet and Sour Cabbage Soup simmering on the stove. That will be dinner when I get home from teaching tonight. It's a really easy recipe that takes just a few minutes to throw together and then just simmers for the rest of the day. It pretty good by itself, but once in a while I'll add meatballs and it's really good that way too. Last night was the October Windy City Knitting Guild meeting. Mary got her newsletter a couple of days ago. I haven't gotten mine yet; I suspect it might come in another "We Care" envelope from the post office. Mary and I went to the meeting together. We stopped at Reza's on the way, though. Lamb kabobs and dill rice were just the thing. I also tried their hot sauce for the first time and it was really good. We were a little late to the meeting, but it was worth it. Corrine Neissner and Bonne Marie Burns each gave presentations on "fusion" knitting--a combination of machine and hand knitting. They're both expert knitters and designers. Now I'm kind of jonesing for a knitting machine. I can see how handy it is if you want to create prototypes for designing. 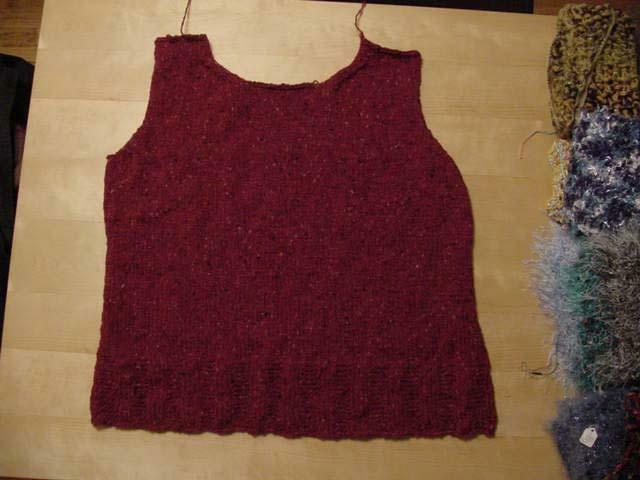 I'm big on prototypes but have given up on them becuase by the time I've finished the prototype I don't always have it in me to knit the actual item. So a machine seems like a pretty good idea. There was quite a crowd there. It was nice to see so many people sitting and knitting in the same place. Mary worked on the collar of the sweater she's making for her brother. I worked on the second sleeve of Mavis (!). I just checked out Mary's blog. She's excited because her new ipod just arrived. She's been obsessing about that thing ever since she ordered it, and she ordered it the day Apple announced it. I'm glad it's finally here so she can start playing with it. I'm making this, too. I'm almost done with the front. I'm going to do the sleeves on my machine, so I might be able to wear it this winter!